Finding suitable gifts for a boss may seem like trying to find a needle in a haystack, but in reality, it's really much easier than most people think. Choosing a great gift for your boss depends on the same things that choosing a gift for someone else does, namely, how well you know them. If you're not sure what to get for your boss, try taking the time to find out what sorts of things he or she is interested in. If you're still stuck, don't worry! We've got tons of amazing gift ideas that your boss is sure to love, whether you know them well or not! Everybody loves sweets, even bosses. Its hard to go wrong with a glass jar of your boss's favorite candy for a yummy gift that he can keep on his desk to snack on while at work. However, if you'd like to go the extra mile, baking some delicious cookies or other delectable pastry yourself will show that you've put time and energy into the gift. Just be sure it looks and tastes good! Everyone appreciates a good coffee mug or thermos. If your boss is fonder of tea or some other beverage, buy something that fits what what they like. But remember, if you're going to spend money on this gift for your boss, do your research and make sure the coffee mug or thermos you get is top quality. You don't want to be remembered at the employee who bought the terrible thermos that leaks hot coffee all over the place! Plants are often given as gifts in many cultures for all sorts of occasions. If you know your boss's birthday, chances are there's a flower for it. Do some research online an buy a bouquet of her favorite flower or her birthday flower. 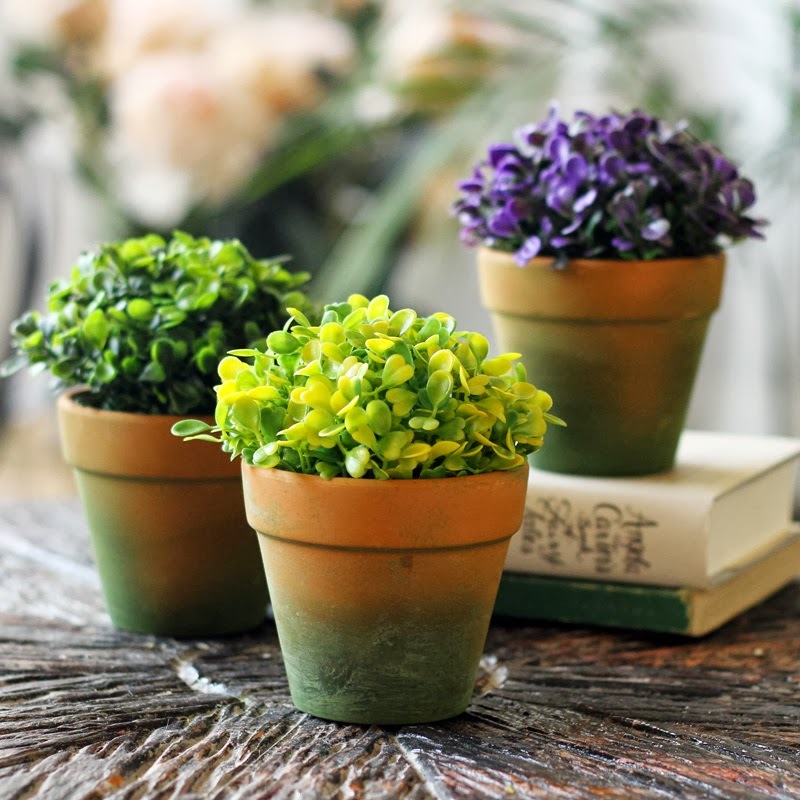 Or better yet, buy a nice, easy-to-take care of potted plant to decorate her desk with. Dracaenas, peace lilies, and cacti are beautiful, easy to care for, and the first two even reduce air pollutants! 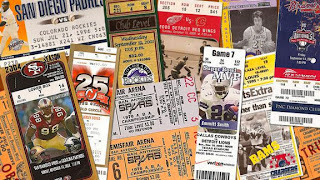 If your boss is a fan of a particular sports team, movie series, or opera house, go ahead and buy them a few tickets to that event. Be sure to buy more than one so he or she can take some buddies along with them. If you don't really know your boss's interests, just buy a substantial gift certificate to a fancy restaurant so they can enjoy a nice dinner out with their significant other! Anything with your boss's name engraved on it shows that you put time into getting the gift for them. 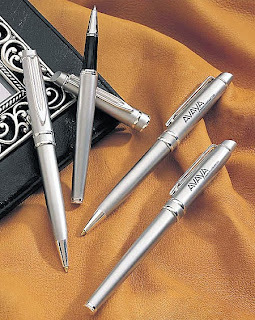 Things like fancy pens, coffee machines, phones, or watches make great gifts for elderly bosses, especially if you take the time to get them engraved. However, if you'd rather not go the traditional route, take the time to really research what your boss enjoys and buy them something for their favorite hobby or something to touch their heart. If you work in an office, its hard to go wrong with the office theme as a gift idea. There are always ways to improve an office space. If you're hard pressed to find a gift for your boss, things like fancy digital clocks, computer monitor arms with ergonomic design, desk toys to relieve stress, or silver gift pens will undoubtedly improve your boss's work experience, and perhaps your own as well! Office chairs can be a source of major discomfort if they aren't top-notch. If you want to really go all out for your boss, buying nice ergonomic office chairs for executive use can be a great way to show your appreciation for them. 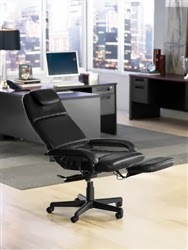 Chairs like the 22111 Verte Executive Chair by RFM are hailed as the most most comfortable office chairs in existence. These ergonomic chairs are always comfortable, designed to relieve pain and increase efficiency and productivity in the workplace. They make hard gifts to beat for a boss! Is your boss thinking of re-designing the office? Why not pitch in with a gift to help her out? Buying a cool new conference table may sound like a lot, but it may just be the inspiration she needs to get decorating. Tables like the GEL8WSTM Alba Conference Table by Global exude fabulous modern style that easily matches any workplace. Even if it doesn't seem like it, your boss probably likes to relax at the end of the day just like everyone else. If you really want to wow your boss, buying comfortable recliners with leather upholstery will definitely show him he's appreciated. Do your best to remember his house decor from the last Christmas party he held so you don't buy anything that might clash though. 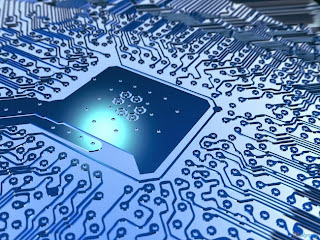 Everybody loves tech these days. If you're ever confused about a great gift to stun your boss, buying something shiny and computer-ish will definitely do the trick! 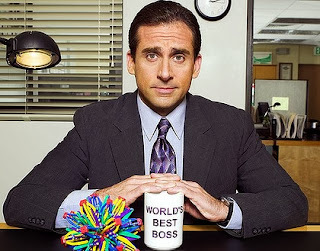 Find out if your boss prefers Microsoft or Apple and then buy him a bunch of great computer accessories like USB cables, wall chargers, external hard drives, or maybe even a tiny affordable laptop. If you can't find out what sort of system he uses, things like the CPU05 CPU Holder by ESI make convenient high-tech gifts no matter what computer he has! Proper cleanliness starts at the individual level. If you want to avoid the runny November nose, start by staying clean on your own. Watch where your food falls during meal times and clean it up right away. Constantly sanitize your office desk, especially things that you or others may touch frequently, like computer keyboards. Tidy up your office space as you go. 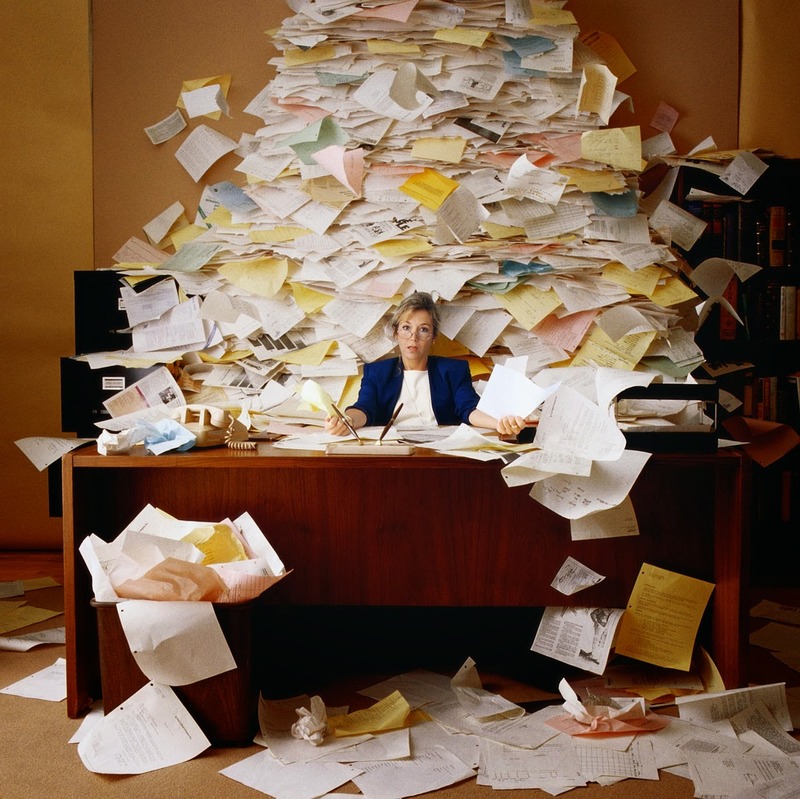 Instead of waiting until the end of the day or the end of the week to sort through papers, sort through them on the spot. Have designated areas for papers you might end up using later, and toss the ones you know you'll never need again. This kind of meticulous organization not only forces a clean lifestyle, it also increases productivity and efficiency at work. However, while all of these tips are helpful, you must maintain the most important one of all to keep from getting sick - wash you hands constantly! Individual cleanliness is useful, but it doesn't do very much in a public environment unless everyone practices it. That's why keeping clean with others is so important. Group cleanliness will not only give a good impression of your business, but it also increases workplace efficiency and productivity exponentially! Think about it: cleanliness means organization which keeps important things from getting lost, jumbled, or cluttered, and sanitation keeps people from getting sick so they spend more time working. If you want to improve the cleanliness of your office, start by emphasizing group clean ups. 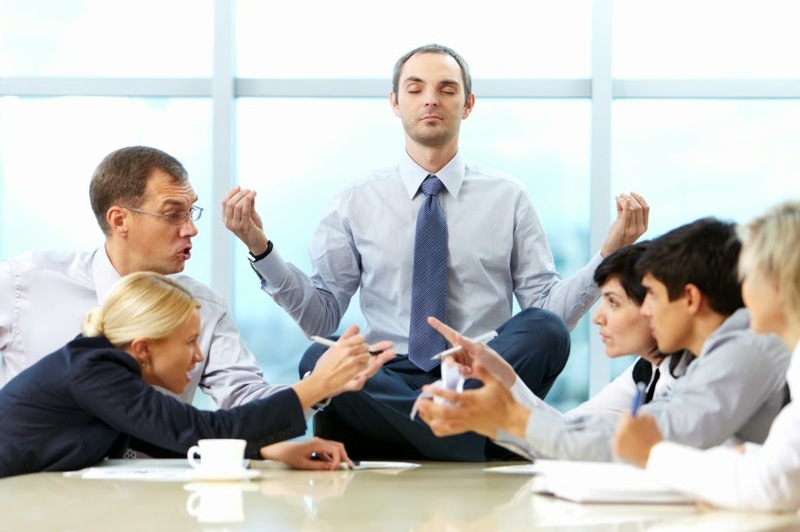 Assign everyone a job and a space to clean with a group of co-workers at the end of the day. This technique is already used in schools in many Asian countries in order to teach responsibility and cooperation. When everyone works together, it works like a charm! If your workplace is too big and to bustling to effectively emphasize group cleaning, there is a great alternative. 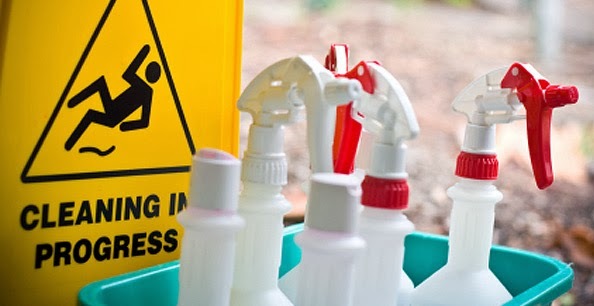 With cleaning crews, the only thing your workplace will have to emphasize is organization. The job of a cleaning crew is not to know what papers go where, but to sanitize, and they usually do a spectacular job of it. Both employees and customers will benefit from an organized and sanitized environment because the clean look gives a good impression of your business, while the cleaned surfaces prevent the spread of sickness. 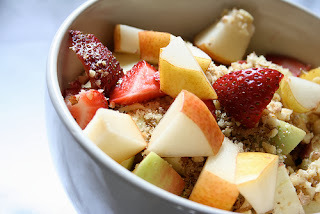 Eating at the office desk can cause all sorts of problems where cleanliness is concerned. Repeated use of retractable keyboard trays for office use is dangerous enough without degenerating food particles festering between the keys. When food particles are lying around it can attract pests in the night, including bugs and rats that carry disease and spread germs even further. The good news is that if you and your coworkers clean your desks regularly and refuse to eat at them, the bugs will have no reason to show up. In addition, you also prevent the spread of germs from sharing computer keyboards. Finally, the greatest byproduct of microbial cleanliness is that, with all the intense sanitation, everyone can see your beautiful computer desks with modern design, rather than leaving them hidden under piles of papers! You may never realize it, but the layout of your workplace actually has a lot to do with how your workplace functions. Inefficient placement of furniture can hamper workplace productivity and have a negative impact on the way your workplace looks and is perceived by guests. In this case, the best remedy to promote effectiveness and cleanliness is to change things up! When you've got a lot of employees, keeping them trapped in a field of cubicles or jumbled together at islands of office desks just looks cluttered. Instead, improve the efficiency of your workplace by adding stylish workstations for multiple users, so that they can work closely, yet comfortably. 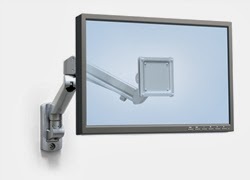 Multi user workstations are efficient, easy-to-power, modular, and often ergonomic. In addition, choosing comfortable ergonomic chairs for desk use can improve the way employees feel, leaving them with more energy and increased work ethic. With a more efficient office, it's much easier to keep things clean and functioning properly. Don't risk losing sales or employees to the dreaded cold season. Just keep things clean, and reap all the benefits! With Thanksgiving on the way, there's no doubt that everyone will be breaking out the tables and chairs for a day of great food and even greater company. This is the time of year to gather together with friends and family to eat and give thanks for what we've got, and there's no better way to do it than with a big collective dinner party! Believe it or not, dinner parties can actually be much easier than trying to cook all the food yourself, especially if you decide to do a potluck! If you're thinking this sounds like a good idea, here's some special tips to get your dinner party up and running! Having a memorable dinner party starts with a memorable set up. Don't worry! This is the fun part. Lucky for you, Thanksgiving already has a ton of associations to make decorating easier. Just cover everything in warm colors like yellow, orange, and red, and throw in a few neutral brown colors to balance things out. 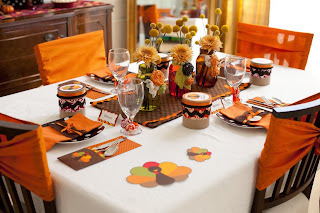 Be sure to get colorful table cloths for when people spill their food - which, at Thanksgiving, is always inevitable. If you want to add a little bit of extra pizzazz to your Thanksgiving party, just have the kids go out and collect a bunch of the fresh turned leaves to decorate with. For a centerpiece, the classic cornucopia filled with fall harvest fruits and veggies like corn, apples, and pumpkins always leaves smiles on faces - and gets appetites rumbling! There's no doubt that Thanksgiving is all about food. From the moment we hear the holiday's name, our minds begin to picture juicy turkeys, yummy stuffing, and mashed potatoes. However, Thanksgiving is also a source of major headache for anyone that has to cook for the crowd, since it usually requires hours of intense labor in the kitchen. Often, the very mention of a "Thanksgiving party" can leave anyone who has attempted one cringing. But there is an easy way out! Potlucks are a favorite for a reason at office parties and church gatherings, and that's because they're super simple. Instead of trying to do everything yourself, call a bunch of friends to the party too and ask that they each bring a couple of Thanksgiving favorites to dine on. Not only will you have great food, you'll also have great company to share it with! Unless everybody you invite to the party doesn't have kids, you can pretty much guarantee they'll be at your dinner party. Kids will without a doubt liven things up, and keep you on your toes, but you certainly don't want the little monsters in the kitchen when you're trying to get dinner on. Instead of risking disaster, its best to have a battle plan prepared. 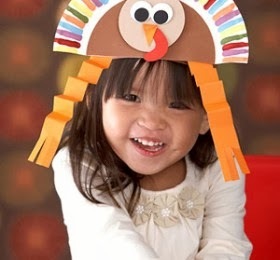 Set up a bunch of fun crafts and games outside, like pin the feathers on the turkey, paper-bag pilgrim outfits, and paper plate turkeys. Of course, you'll need a few grown ups to monitor the rascals and help them with the projects, but it beats having them under your feet all day. By the end of the day, you'll even have a whole new batch of kid-crafted decorations to display around the house! Often, one of the biggest issues with any sort of communal dinner party is where to put everyone. Unfortunately, many of those old-school folding event tables weigh a country ton (and they're not always the most sightly things on the planet either). Instead of spending an hour and a half with your significant other trying untangle the beastly things, why not check out some of the newer folding table designs? Nowadays, affordable folding tables for event use can come in all sorts of stylish shapes and colors to enliven your party. If you'd rather invest in tables that can be used for a many purposes, versatile tables for training room use make wonderful alternates. Not only are both options insanely affordable, they're also durable, and can be used around the house and at all sorts of events for years to come! The final hurtle of the Thanksgiving dinner party is gathering enough seats. Insufficient seating can present a huge problem at any event, because it often forces people to stand. While standing and munching on hors d'oeuvres is acceptable at almost any other event, at Thanksgiving, it can be a huge embarrassment. If trying to juggle a plateful of Thanksgiving dinner while standing doesn't result in a huge mess, you can bet it will definitely result in guests feeling extremely awkward. The good news is that all of this can be avoided if you know what to shop for! Most office furniture websites carry stylish mesh seating for guest use that works great at events. In addition, comfortable chairs for training room use are usually equipped with mobility and nesting features for easy storage. Just like the folding tables, both of these options are super affordable, and often available in bulk quantities for low prices. They can be easily stored and used for everything from holiday dinners, to sporting events, birthdays, and even everyday use at home office desks! Everyone wants to get as much done at the office as possible, but just like any job, its impossible to get things done without the right equipment. Did you know that using outdated office furniture can actually lower the overall productivity and efficiency of your workplace? It sounds hard to believe, but it can even take a toll on the work ethic, health, and mood of those who use it as well. The good news is things don't have to stay that way. There are tons of amazing, affordable office products out there designed to take any business to new heights. 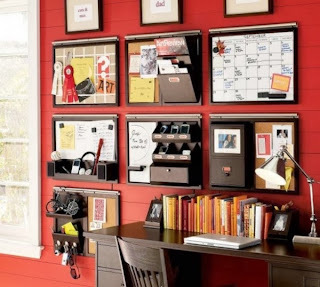 To help you out, here's a few great products that no office should ever be without! Got a computer at your desk? Good. They're fabulous ways of getting tons of work done, and in the digital age, that's no small task. However, leaning over your desk to type and see the screen could be taking a terrible toll on your health. Spending too much time hunched over can cause all sorts of back problems, including awful pain, sciatica, and even a deformation of the spine! Ouch. Just because it happens to thousands of Americans though, doesn't mean it has to happen for you. By adding ergonomic monitor arms to your desk, you can stop the health problems before they even start. These handy little inventions can mount to either walls or desks to support your computer screen. 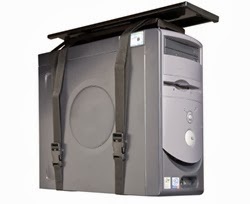 The best part is that they're complete with stretching retractable arms that bring the computer to you, so you don't have to strain yourself trying to get to it! Speaking of computers, you may have accidentally kicked the drive that takes up so much space under your desk more than a few times by now. Annoying right? Well, did you know that keeping your computer's hard drive on the floor is dangerous? Not only does it take up all the leg room, but it can also be a recipe for disaster. Anyone whose spilled their morning coffee should easily be able to envision spilling a drink on their computer's hard drive. The flurry of sparks and steam is probably nothing compared to the rages of an angry boss who now has to pay to fix your office computer. Avoid the train wreck before it derails with a simple, inexpensive CPU holder. These nifty little devices mount underneath desks to keep hard drives off the floor. In addition to freeing up desk space, you also skirt tons of potential disasters. You even get much of your leg room back! 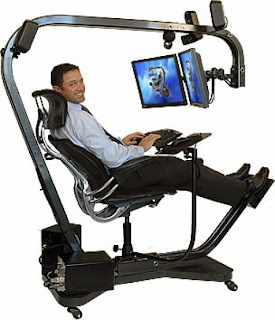 If you waited too long to buy that monitor arm and are paying for it with back pain, never fear. Office furniture manufacturers have recognized the plight of office workers who are plagued with back pain, and they've developed a solution to knock pain out of the park! 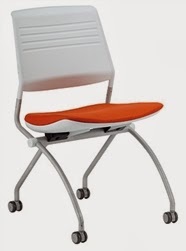 Ergonomic seating is one of the fastest growing trends in office furniture today. 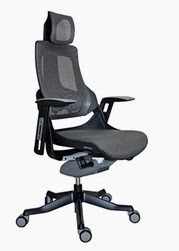 All ergonomic furniture is highly adjustable, designed to improve the comfort and productivity of the workplace. Nowhere is this more evident than in ergonomic office chairs. Just as there is an ergonomic seating solution for nearly every office need, there is also an ergonomic chair for just about every ache. So whether you have back problems, joint pain, leg cramps, or even poor circulation, know that there is an affordable ergonomic office chair out there with your name on it! Few people realize how important proper lighting is in the workplace. It may seem like a simple thing, but poor lighting in indoor environments can take a huge toll on work ethic, mood, and energy. 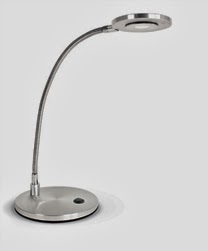 Studies have shown that employees that work under bad lighting conditions have a much higher propensity to develop eye problems, drowsiness, and even depression. Instead of suffering through it, crack open a window and let the sunshine in. Natural lighting is the best antidote to things like depression because it works wonders on the psychological mind, making individuals feel brighter and more energized to get their work done. However, if your workplace lacks windows, artificial lighting works good too when its sufficient. Instead of living like a vampire, brighten things up with a desk lamp or two. You may be surprised how much better you feel. Ever feel like you're constantly running around the office in search of the things you need? Modular furniture is definitely your answer. The word "modular" refers to the idea that everything should be kept within arm's reach for maximum efficiency. Businesses that have incorporated ergonomic workstations for office use into their practice will certainly attest to their efficiency and superior design. This type of furniture nearly always frees up a ton of space by replacing scattered islands of traditional office desks with workstations for multiple users who can work together comfortably in a more efficiently designed space. In a public work environment, having a comfortable place for guests is an absolute necessity. If guests are happy and contented, it gives businesses more leeway in relations with them. In order to improve visitors' perceptions of your workplace and earn their respect, make sure your guests are catered to. 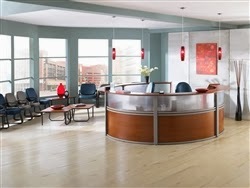 Incorporating curved desks for office reception use makes guests feel as though your business wants to help them. The rounded design is approachable from all sides, and visitors will certainly notice. Additionally, provide them with comfortable seating solutions such as lounge chairs and sofas; perhaps even some refreshments. Remember, the more comfortable they are, the better their view of your business is. As they say, "the customer is always right!" Keeping up appearances is valuable in all walks of life, but it is perhaps nowhere more important than in the workplace. Having professional meeting furniture around shows business executives that your business cares about what they think. Always be sure that guests from other companies are comfortable by providing stylish conference chairs with leather upholsteries and modern design. Show guests hospitality by providing refreshments and conversing with them in an elegant, contemporary conference room. It may sound like a lot of work, but putting in the extra effort that other companies may not always do could make a great difference if your workplace depends on company relations. Don't fall behind where it counts! Here's a few fun tidbits to amuse your co-workers with: Did you know that January is actually National Bath Safety Month? Or that August 2nd is National Mustard Day? Its true! Most people live their whole lives without ever knowing that nearly every day of every month is some sort of strange holiday. In fact, November is one of the weirdest months of them all, being both Peanut Butter Lovers Month and National Sleep Comfort Month. Its also filled with a ton of weird holidays like King Tut Day, Look for Circles Day, and even Have a Party With Your Bear Day! 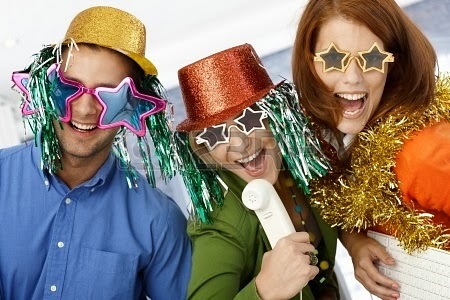 With all the great fun stuff going on, why not throw a party at the office to celebrate it all? Here's a few wacky holiday party ideas to spice up your November at work! 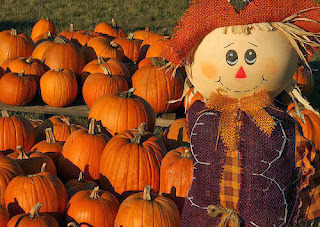 An oldie but a goodie, nothing quite says "Fall" like a Fall Festival. While it may not be nearly as wacky as Have a Party With Your Bear Day, fall festivals are something just about everyone can get involved with and loves to enjoy. Because of the pumpkins, the hay, the colors, and associations with the harvest, November is the perfect time for one of these Autumn-Themed festivals. The best part about it is that it doesn't have to occur on any specific day. All of November suits the theme. If you want to liven up your November and bring the co-workers together before the holidays, cook up some apple cider and gingersnaps and get everyone together after work for a bit of down time after a hard day. You may even decide to take festival to the max by setting up booths, games, and hay rides available to the public. Not only will you bring joy to a lot of faces, you'll also boost the prestige and likability or your company! Now here's an interesting holiday! You may never have noticed, but November 29th is actually Square Dance Day in the U.S. (If you don't believe us, just check out HolidayInsights.com/moreholidays and see for yourself!) Still popular in many rural areas of the western and southern United States, this variation of the traditional step dance was brought to America by English, Irish, and Scottish settlers early in our history. Because of its associations, Square Dance Day is the best day out there to host a Western-themed party. If you want to liven things up in your workplace, send out a notice and wait for November 29th, then grab your cowboy hats, banjos, and old western movies, for a day of rootin' tootin' good fun. We know how corny it sounds, but believe us when we say that its a day no one at the office will soon forget, so grab a co-worker and "dosey do" (its great exercise too)! Always occurring on November 20th, this wacky holiday is all about just what it sounds like: absurdity. The best part about this crazy holiday is that it doesn't really require an actual event or a party. All you have to do is send out a notice to the whole office notifying them that everyone is allowed to participate in this month's Absurdity Day. Giving the office an excuse to wear silly hats and those funny glasses with the mustaches will show both your workplace and the community that your business has a fun side. In addition, everyone will undoubtedly share a few laughs and grow tighter as a team. Absurdity Day is the perfect time to let loose and play a few harmless pranks on one another. Not only will it keep things fun, but it also keeps everyone on their toes! There's no getting around the truth, the vast majority of us associate November with food. Why not celebrate Thanksgiving a little early on November 3rd for National Sandwich Day? This holiday is super great, easy holiday to celebrate at work. 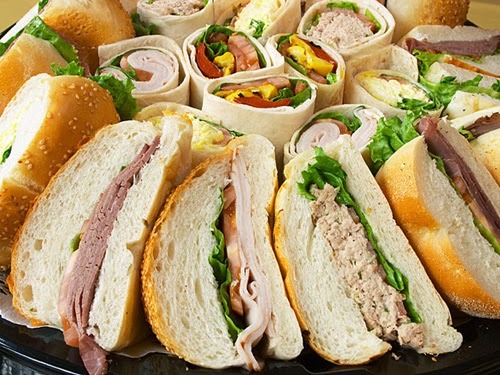 Instead of planning some big shin-dig where everyone needs to stay after work, just ask anyone who wants to participate to bring in some cold cuts, cheese, chips, and condiments for a simple communal lunch at work. If you're willing to ask around, some co-workers may even have a panini press or two that they're willing to contribute to the mini-party. Just set up a few affordable folding tables for event use or make due with the large tables for conference room use your workplace might already have, and turn typical lunchtime into a fun-filled event! Even though November is riddled with a whole bunch of fun, crazy holidays, there's no denying that Thanksgiving is the pride and joy of this month. This holiday is all about coming together as a community to give thanks for the things we've got. What better way to celebrate this idea than with the people you work with? Of course, most workplaces close down for this big holiday, but since you're going to have to return to work anyway, go ahead and get rid of the Thanksgiving leftovers before they go bad with a Thanksgiving pot luck at work! 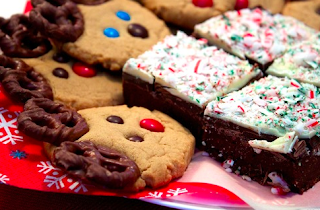 Notify everyone in the office of the party and have them stow away the goodies in the break room until the end of the day. Then, set everything up on a few of the office tables for break room use and get everyone out up of their task chairs for office applications in order to enjoy each other's time. 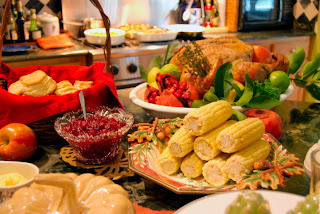 If there's enough leftovers, invite your co-workers to bring their families along to give thanks too! Adding a stylish new office desk to any room can be a fun experience. Choosing the finish and the colors on the chair to match the room, and deciding where the desk could go gives many people the opportunity to use their creative side by playing interior designer. Unfortunately, while office decorating can be tons of fun, often the biggest mistake people can make is not hiring a professional to choose and install their desks. Amateurs often have a tendency to make the mistakes that people like interior designers have had drilled out of them through years and years of practice and repetition, but you don't have to fall victim too. Here are some helpful mistakes to avoid when purchasing a new office desk! Perhaps the biggest mistake any decorator can make is forgetting to measure. 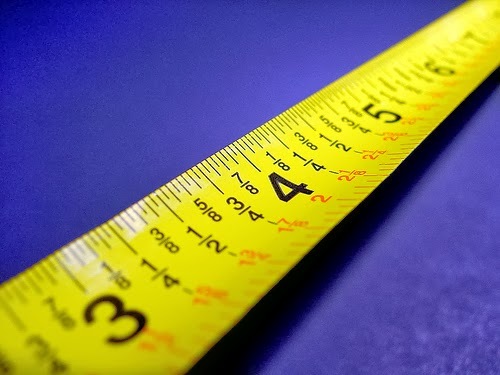 Inaccurate measurements can be disastrous letdowns, since most people typically don't find out their measurements were off until after their office desk arrives and is painstakingly assembled. The best way to avoid this is through careful reading of desk features and measurements. Once you've decided where to put your office desk, either in a home or business environment, use a tape measure or an electronic measuring tool to take account of the length of each wall that the desk could potentially touch. Never, ever forget to take into account how power outlets, doors, and windows function in the space so that you're aware of how the new piece of furniture may effect the room. Its never a bad idea to measure and sketch out the entire room on a piece of graph paper, making notes of where all the other furniture, doors, windows, and power outlets are and marking them to scale. Finally, read through all of the measurements of the desk you want to buy, including the measurements of its drawers and other extendable features. On another piece of graph paper, draw the desk to the same scale you used for the bedroom, then cut it out and see if it will fit in the space you want. Don't forget to leave a bit of extra space for yourself and the office chair. It's no secret that office desks can get expensive. Many executive desks for home and business use can easily exceed two-thousand dollars if you aren't careful. 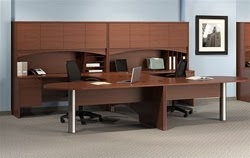 However, there are plenty of office desks at affordable prices available if you look for them in the right places, and looking in the right places begins by looking for coupons. Any office furniture retailer that cares about its customers will always have coupons floating around or sales going on, particularly on holidays. Never pay full price when you don't have to. 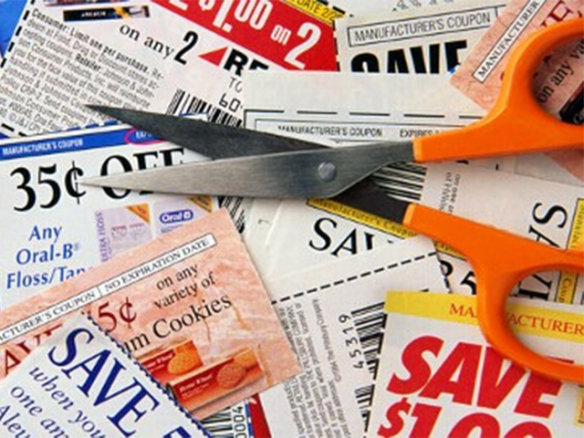 Instead, wait around until for a holiday before you hit the internet to look for coupons and sales. While the best times to shop for office desks are usually around the bigger holidays like Halloween, Thanksgiving, and the big December days, it's still possible to find a few good sales and coupons on Mother's Day, Father's Day, Veteran's Day, and the Fourth of July. With all the deals going on, there's no excuse for mission out on all the goods when shopping for new office desks! Don't ever pay for shipping when shopping for a new office desk. 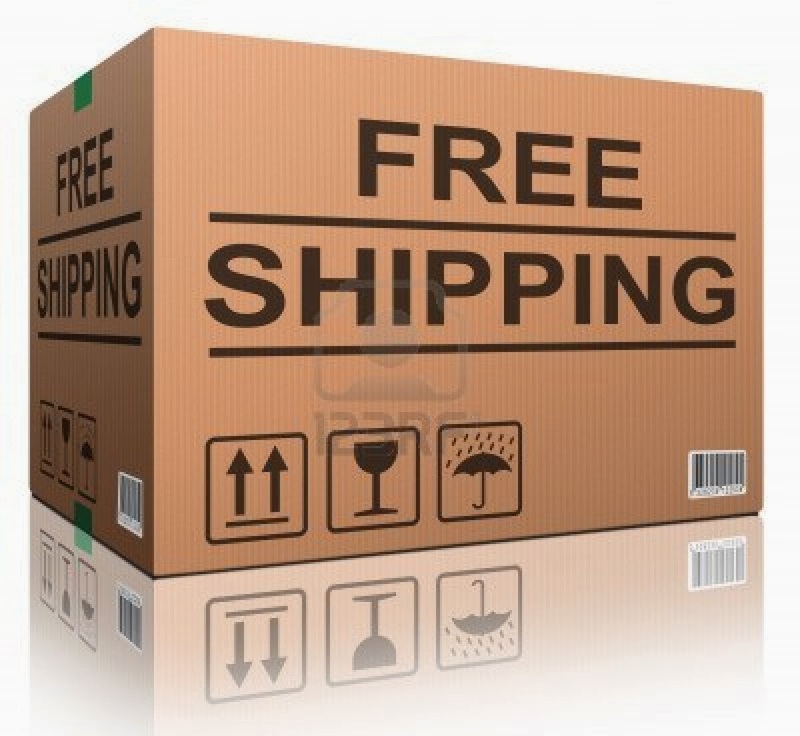 Even if the prices look lower on some websites, if it doesn't say "free shipping," know that you will definitely pay more than the difference if you buy from them. Most office furniture sites carry furniture from all the reputable names. Choosing affordable office furniture from top brands like Mayline, Cherryman Industries, or Global Total Office will ensure that your office desk is of the highest quality, since these some of the best office desk manufacturers out there today. Just the same, you should never have to pay the manufacturer's list price when buying quality furniture for office use. As we've said, office furniture can get expensive. Be sure to shop around a bit before buying. 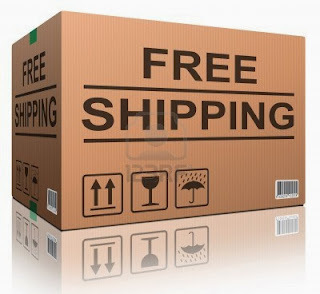 If you find a desk that you just can't live without on one website, write down its product code, then open a new tab and search for it to see if another site offers a larger discount with free shipping included. Not only will you have your dream desk, but your smart shopping may also leave you with enough money to buy a matching office chair as well! So you've just recently upgraded your home. What do you plan to do with all your old furniture? Sell it? Give it away? Why not do something entirely new! Just because those old office desks and sofas look like beat up furniture now doesn't mean they have to stay that way. DIY fanatics all over the globe have made repurposed old furniture into an art form, and so can you with a bit of effort. 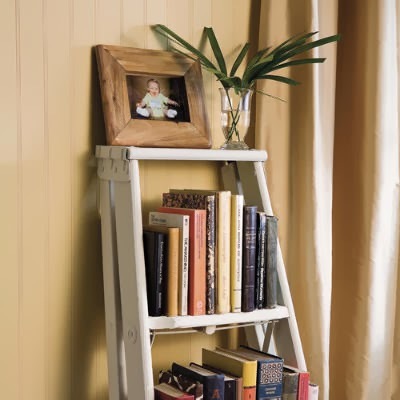 You've upgraded your house, now here are some great ways to reuse all that furniture! This one's so easy its ridiculous. So you've got an old wooden ladder in the shed that hasn't been used in a hundred years and a bathroom, why not make a cool towel rack? All it takes is a bit of sanding and a paint job if desired, and voila! You've got a hip new towel rack in your bathroom. The best part about this project is that all the steps on the ladder can stylishly hold a ton of towels. If the steps are wide enough, it can even double as a shampoo shelf! 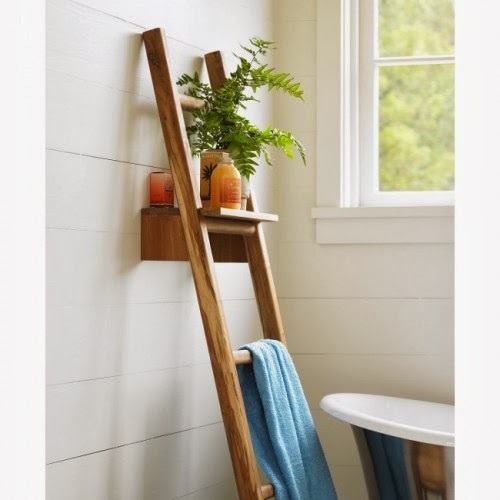 The ladder can be placed vertically against the wall with the towels simply draped. Or it can be horizontally like a shelf high up on the wall, so that the towels hang down from the ladder steps. This project has become extremely popular because its so simple and easy to do. It's sure to earn you a host of compliments when you hold the party to show everyone your redone house! 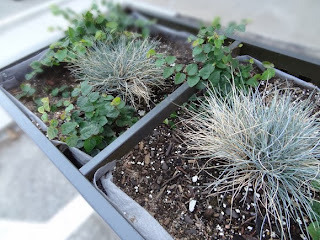 Here's another easy project thats tons of fun to do. All it takes are some window shutters or old closet doors with slats. Simply angle the doors and open or break some of the slats, then stick a plank of wood through them and you have instant shelving. This project makes a great bookshelf that looks great in any living room or bedroom when completed. 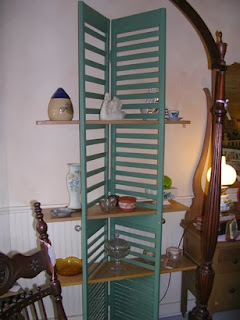 You may even decide to put it in the bathroom next to your ladder towel rack so that it can double as a shampoo shelf! The best part about this project is its simplicity, and the fact that your shelving options are only limited by the number of slats on the doors you use. Just be sure the shelves are evenly spaced and that you don't overload them. We don't want your cool new project getting top-heavy and falling over. Got an old stepladder? Well, you're in luck. Stepladders are one of the greatest repurposed house items around. All it takes is a little sanding, screw tightening, and some painting and these babies can make remarkable shelves and tables. They can be hung on walls to hold trinkets, or left open on the floor to hold even more things. If you like, many of them can become nifty end tables if they're topped with a piece of wood or glass. This project from Martha Stewart requires almost no work at all. 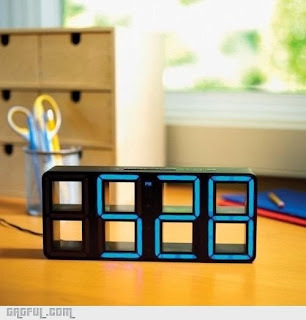 Sometimes if you want the coolest in office accessories for home use, the best way to get them is to make them yourself! 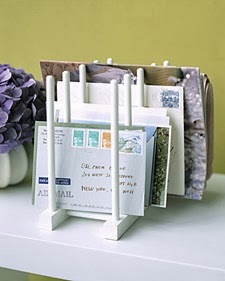 All this project takes is a lid rack or dish rack and you've got an instant organizer for your mail and files. The lid racks can be painted however you like, and they look super cute just about anywhere, from office desks with modern style, to chic entry ways! They're also great recipe holders in the kitchen. To get the most out of your new mail sorter and make things easier to see, be sure to place smaller objects like letters in the front, and bigger things like magazines in the back. Looking for a way to spruce up your backyard? Why not make use of those old office file cabinets by turning them into planters like Patrick Beyer? With the advent of computers, things like vertical file cabinets for office use have fallen by the wayside, but that doesn't mean they have to become scrap. In order to turn your office cabinets for storage into cool backyard planters, start first by removing the drawers and cleaning them. Then place the planters on their sides with the open end facing upward and set them on some cinderblocks. Spray paint the cabinets to proof them for the weather (be sure to use outdoor paint if they're wood and special metal paint if they're metal). Then drill some holes in the bottom for the water to leak through and fill the empty drawers with a landscape fabric to make sure the dirt stays where it should. After that, plant your plants and invite everyone over to see them! One of the biggest things people consider when buying just about anything, from groceries to cars, is "how long will this last me?" With office furniture, this is especially true. You don't want to go and buy something that will break after less than a year of use. Still, with most warranties lasting only a year or so, it can be hard to ensure that you have made a purchase that will earn back your money's worth with reliable service. Well, not anymore! Here's a few tips and tricks that will help you protect your office furniture investment so that those chairs and desks will last for years to come! Just like automobiles, furniture that is checked and maintained regularly for stability and quality will run for a long time. Things like chairs, desks, sofas, and anything else that relies on screws for structural support may fall apart before they have to if they're neglected long enough. 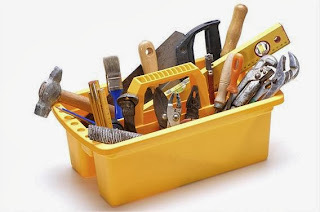 The best way to ensure that your furniture will last as long as possible is to break out the tool chest and play handyman once every few months. Tighten the screws on old desks and sofas that may have loosened with age. Oil the hinges and adjusting mechanisms on aging office chairs and cabinet doors. Taking a little bit of time out of the day to give things a quick once over and make sure they're functioning will work wonders on furniture. If you put in the effort, your office furniture will undoubtedly reward you by lasting longer than you ever though possible! Don't end up like this lady! Organization may seem like a silly thing when it comes to protecting your office furniture investment, but it can actually make a huge difference. You may not even realize it, but overtime, things like bookshelves and file cabinets can start to sag under the weight of piled up papers and catalogs. Going through every so often and cleaning out the old stuff you or your company no longer needs anymore can help keep the furniture from bending under the pressure. Straighter shelves are much sturdier than bent ones. Making the effort to keep unnecessary weight off of them will give your cabinets, shelves, and drawers a fighting chance against time. Who knows? You may even find your office is more efficient because of it! Any dentist will happily tell you that regular cleaning is key to keeping away cavities. The same is true for office furniture. Even while desks and chairs may not risk gingivitis, regular cleaning is still hugely important when it comes to protecting your office furniture investment. Not only does it prevent the spread of germs, protecting your whole office, but it can also earn you years of your furniture looking spectacular. Making sure your furniture is cleaned, polished, and protected will prevent any corrosive substances from building up or marring your beautiful furniture. In addition, furniture that is kept clean can often be resold at a fairly high price if you ever decide to upgrade! You may or may not have started hearing the word "ergonomics" in strange places. From mattress commercials to ads for affordable office chairs with ergonomics, furniture manufacturers have really been working this word recently, and for good reason. Ergonomic furniture can really help improve the health, efficiency, and productivity of office environments. In fact, that is exactly what the study of ergonomics is! If you're looking for the best way to help protect your office furniture investment, there is no better way to start than by purchasing chairs and office desks with modern features such as ergonomic designs. 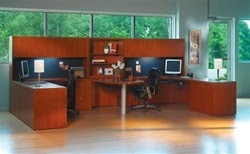 With this style of furniture, you can rest assured that anything you buy will not only help improve your whole office. It will also improve your health and comfort while you work! Most people recognize that wood office furniture looks good, but it can also last a long time. Often, purchasing office desks with stylish luxury wood finishes is a great way to insure that your office furniture will pay for itself with years of use. However, even wood furniture can start to go south if it's not kept up. If you really want to make the most out of your wood office desks for executive use and other wood office furniture, you have to show it. 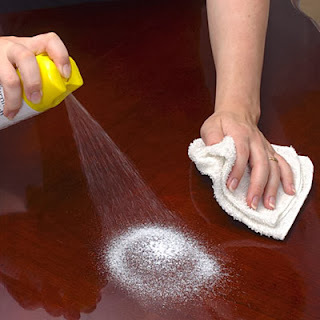 Take the time to go through once every week or so to dust and polish your furniture. Keeping it up will prove that you care. Later on, if you decide to sell your furniture, you may even get more than you paid for by boasting that its an antique! It's no secret that social networking sites have taken over the internet. In our personal lives we look to sites like Facebook, Pinterest, and many others to stay connected with friends and family members on a daily basis. That being said, social networking is an excellent tool that can benefit your office life and boost company morale. 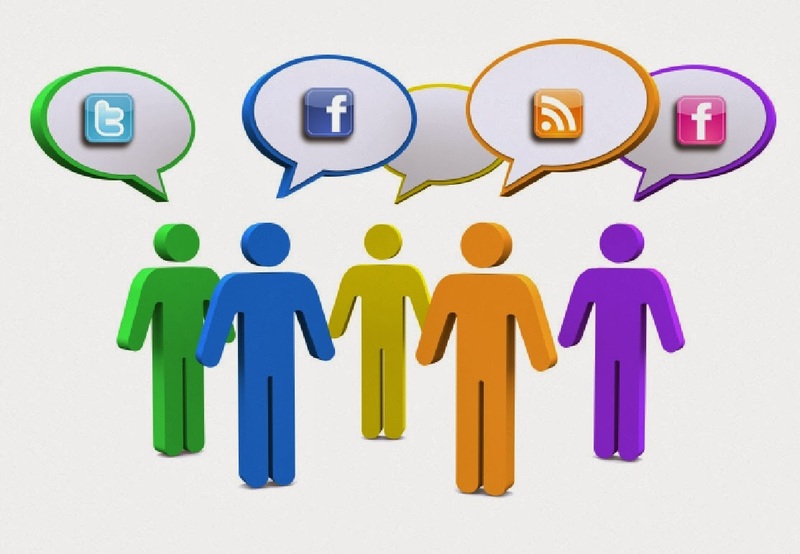 Today's article shares cool ways to improve your business via common social networking tools. Marketing professionals have put a heavy emphasis on branding in 2013. Making your company a household name is a challenging but incredibly valuable commodity that social networking can play a big roll in assisting. One of the first key steps in getting your brand recognized is getting online. A well designed website provides an excellent starting point for any business looking to showcase their abilities and products. Once online it's important to get started on building your social status. Listing your business at the major social sites is a great way to get the word out and increase your following. In today's world, it's all about high quality content. Starting a blog for your business is a great way to create a social buzz around your important events and info. Writing one or two blog articles per week on helpful topics related to your industry will help to establish your company as an authority in your field. Good content is often linked to by interested customers and readers. These digital clients often share your content via their favorite social channels and help build your networking buzz in a major way! Great articles and help with writing excellent content can be easily accessed via any major search engine. Those looking to start a blog for their business will find platforms like Blogger and Wordpress very user friendly and simple to operate. Remember though, when it comes to blogging it's quality over quantity! Facebook is an incredibly powerful social marketing resource that's helping businesses expand their following in a major way. If creating a social buzz around your business is important, a dedicated Facebook page is an absolute must. With over 500 million users and 250 million who log in to their accounts on a daily basis, Facebook is now recognized as one of the most reliable resources available for companies looking to get the word out about sales, corporate event, and other important news. Creating a Facebook page for your business takes less than 5 minutes. Once up and running, let your staff and clientele know to help build your likes and friends. The larger your following the better your buzz. Keep in mind it's all about quality! Earning a excellent brand recognition and a reputable social status online means sharing updates that people are truly helpful and on topics people are actually interested in. If your page is fun, fellow feacebookers will stop by on a regular basis to share our posts, and that's what it's all about! Athletes, celebrities, and major news outlets use Twitter for a reason. This top social resource providers users with 140 characters per tweet to share their opinions and thoughts on just about anything. In 2013, businesses are jumping on board with the Twitter craze in a major way. Rest assured, if you're looking to create a positive social buzz for your business a company Twitter page is just the way to do it. 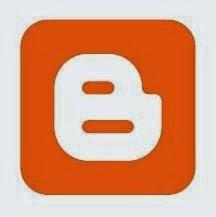 Here you can share your latest blog articles, sales, coupons, and company events quickly and efficiently. Building quality followers will take time. However, once the word gets out on your interesting a fun tweets the buzz will spread like wildfire. 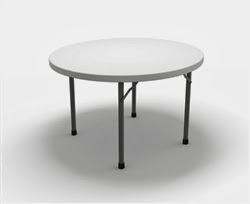 Having a sale on conference tables at your business? 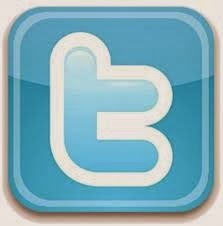 Tweet it! A company fund raiser this weekend? Tweet it! Share helpful info on a regular basis to keep your customers and followers alike up to date with your business. 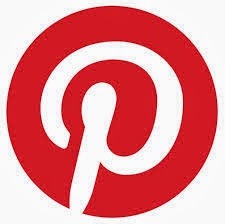 Pinterest is another key social platform that's growing rapidly. Businesses of all types are creating fun Pinterest pages with boards to share their favorite products, places, and pictures of inspiring things. This key resource is a great place to let your business personality shine. If you're part of an exciting company that prides themselves on cutting edge products and new technology, a Pinterest page is the perfect way to spread the buzz. From modern desks for home office use to cool animals, Pinterest has boards for just about every topic. If you're company is a travel agency, posting pics of exciting places would be a great idea. Restaurants will find a healthy niche sharing pictures of tasty dishes and recipes. As with Facebook, building a quality following is the best way to improve your social buzz. Find fellow companies in your field to network with and you'll be surprised at just how much you learn and how many great resources you meet along the way. After all, that's what social networking is all about! Using the above mentioned tools individually will certainly help. However, those looking to master the social world to build the ultimate buzz will find the best results by using these resources in cohesion. Before you know it, twitter followers will be friends on Facebook, Pinterest followers will be re tweeting your messages and the buzz will be bigger than ever! Industry professionals in every field from art to professional furniture services can benefit greatly from creating a positive social presence online. The time to act is now. After all, if you don't, your competition will!